ARLINGTON, Va. – Washington Capitals forward Mike Ribeiro, alumnus and Comcast SportsNet color commentator Craig Laughlin and mascot Slapshot visited the Rita Bright Family and Youth Center, part of the Latin American Youth Center (LAYC), in northwest Washington, D.C., on Wednesday, Feb. 20, to host Capitals Hockey School. Hockey School is a free program, designed to be both instructional and interactive, with the goal of exposing students to floor hockey while teaching proper technique. The trio directed a floor hockey session with 175 students from Meridian Public Charter School which serves a primarily low-income student population in Washington, D.C.’s Ward 1. During the assembly Ribeiro and Laughlin participated in a question-and-answer session and led a skills demonstration for the students. They guided the students through several drills focusing on stickhandling, passing and shooting prior to inviting them to demonstrate what they learned. The clinic concluded with several students participating in a brief scrimmage joined by Ribeiro and Laughlin as their teammates. Ribeiro, who currently leads Washington in points and assists, represented the boys team. Laughlin, who played with the Capitals from the 1981-82 season though the 1988-89 season, represented the girls team. Following a 1-1 tie, the scrimmage ended with the girls defeating the boys in a shootout. Following the clinic, the Capitals donated a set of street hockey equipment to LAYC. The Capitals also provided each student with a hockey 101 booklet, a squishy puck and an autograph from Ribeiro and Laughlin. 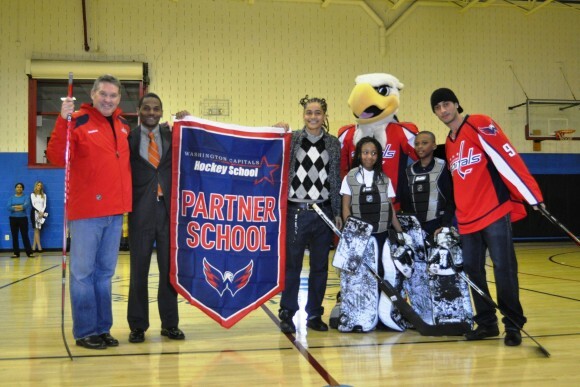 Meridian Public Charter School also received a Capitals Hockey School banner. The assembly marked the twelfth Capitals Hockey School of the 2012-13 academic year. The Capitals host two Hockey School visits each month between September and May and donate street hockey equipment to each participating school. The 2012-13 season marks the sixth consecutive year the Capitals have conducted their Hockey School program. 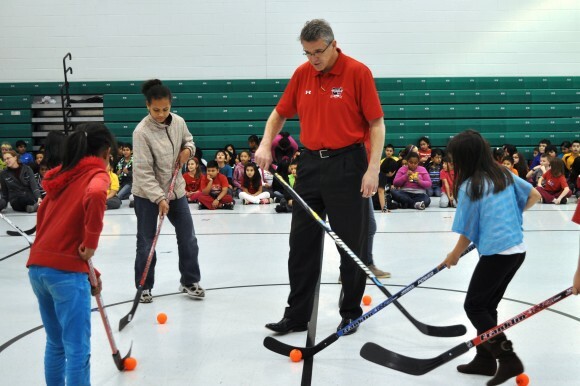 The Capitals have hosted more than 70 clinics and reached more than 10,000 students in the past four years. ARLINGTON, Va. – Around three years old, Washington Capitals alumni Alan May and Paul Mulvey each began playing hockey. 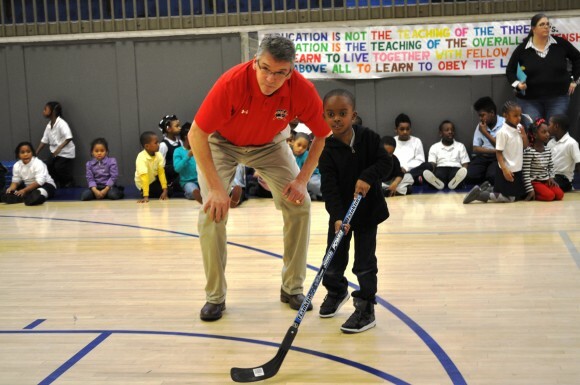 During a Hockey School assembly at Thurgood Marshall Elementary School in northeast Washington, D.C. on Feb. 11, both attributed their success in the National Hockey League to skills they began developing as children, encouraging area students to pick up the sport. Along with mascot Slapshot, May and Mulvey directed a floor hockey session in the school’s gymnasium with the entire student population at Thurgood Marshall. The Capitals adopted the school for both the 2011-12 and 2012-13 academic years. The event was held in conjunction with the Capitals celebration of Hockey is for Everyone™ Month, a league wide initiative that offers children of all backgrounds opportunities to play hockey and leverages the sport as a catalyst to teach essential life skills and the core values of hockey: commitment, perseverance and teamwork. 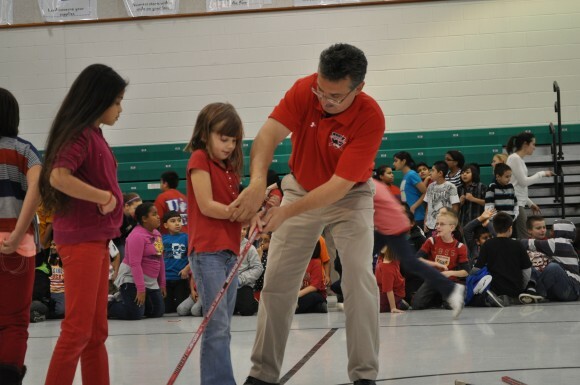 During the assembly May and Mulvey guided the students through several drills focusing on stickhandling, passing and shooting prior to inviting them to demonstrate what they learned. Students, who have been practicing hockey as part of their physical education curriculum, participated in a brief scrimmage joined by May and Mulvey as their teammates. With May representing the girls team and Mulvey representing the boys, the game ended in a tie. 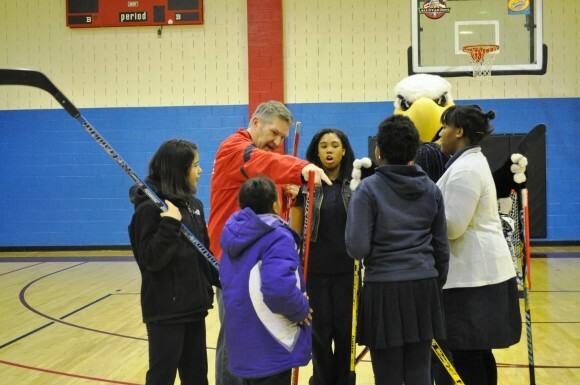 Following the clinic, the Capitals donated a set of street hockey equipment to D.C. Public Schools. The Capitals also provided each student with a hockey 101 booklet, a squishy puck and an autograph from May and Mulvey. The assembly was the eleventh Capitals Hockey School of the 2012-13 academic year. The Capitals host two Hockey School visits each month between September and May and donate street hockey equipment to each participating school. 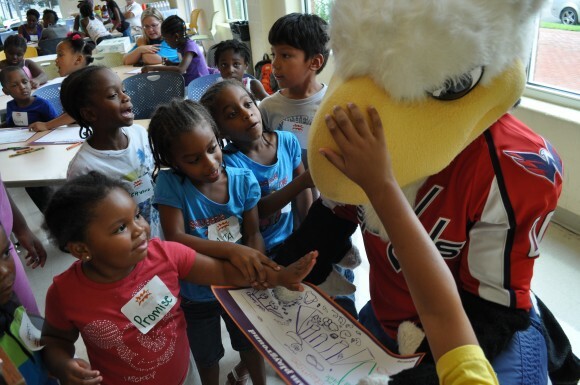 The Capitals adopted Thurgood Marshall Elementary for the 2012-13 school year. 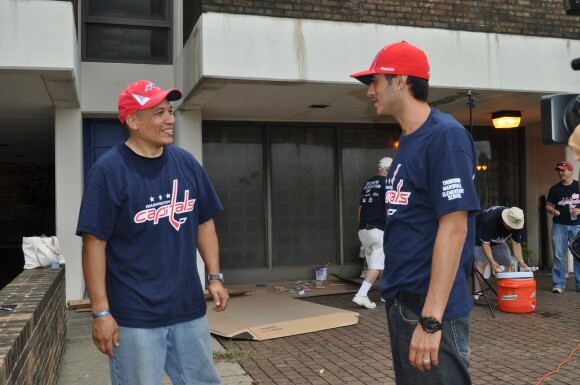 In August Capitals center Mike Ribeiro and more than 150 Capitals fans participated in D.C. Public Schools’ annual Beautification Day, preparing the building for the first day of school. Washington Capitals Charities purchased supplies for the beautification efforts as well as back-to-school items for each child. In addition to participating in the Hockey School program, Thurgood Marshall also is enrolled in the Caps@School program. ARLINGTON, Va. – Washington Capitals alumni Paul Mulvey and Errol Rausse and mascot Slapshot visited Rolling Ridge Elementary School in Sterling, Va., on Wednesday, Nov. 28, for the sixth Capitals Hockey School assembly of the 2012-13 school year. Mulvey and Rausse began the program by answering questions from an audience of 180 fourth- and fifth-grade students prior to demonstrating basic hockey skills including stick-handling, passing and shooting to the group. Students were then invited to practice the skills in front of their peers. Mulvey is a former Capitals left wing who played with the team from 1978 to 1981. Rausse, also a left wing, played with the team from 1979 to 1983. The clinic concluded with several students participating in a friendly scrimmage joined by Mulvey and Rausse as their teammates. The scrimmage ended in a 1-1 tie with Mulvey representing the boys team and Rausse representing the girls team. 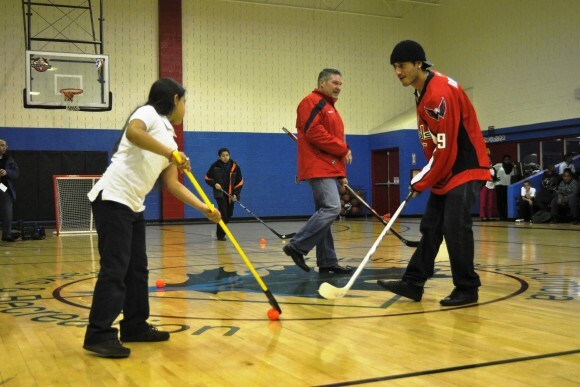 Following the clinic the Capitals donated a set of street hockey equipment to the school. All students received an autographed alumni card, a hockey 101 booklet and a Capitals squishy puck. 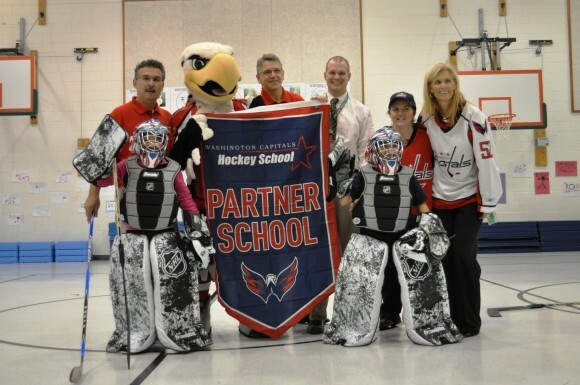 Rolling Ridge Elementary School also received a Capitals Hockey School banner to display in their school gymnasium. The program is currently in its sixth year, with the Capitals hosting two Hockey School visits each month between September and May. The Capitals have hosted more than 70 clinics and reach more than 10,000 students in the past four years. Donating Blood = Saving Lives Thank you to the Caps fans whom have donated blood in the past making the Caps Inova Blood Drives the most successful blood donation campaign hosted by any sports team in the Washington, DC area. WHEN: Saturday, December 8, 2012 from 7 a.m. to 5 p.m.
HOW: Donors can make an appointment now by calling 1-866-BLOODSAVES (1-866-256-6372) or sign up online at www.inova.org/donateblood. Click on the “Schedule an Appointment” button (on the right side), and use sponsor code 7441 to find the Capitals drive. Appointments are required and walk-ins will not be permitted to donate. There is limited space available – only the first 500 fans to sign up will be able to participate. The entire donation process takes approximately one hour. WHY: The gift of life. And as a bonus: Donors will receive a limited edition Slapshot bobblehead and a t-shirt. In addition donors will have the opportunity to take a photo with Santa Slapshot from 9-10 a.m., 12-1 p.m. or 3-4 p.m. in a winter wonderland scene. One free photo and a picture frame will be provided to each donor. To give blood, you must be feeling generally well on the day of your donation, be at least 16 years old, weigh at least 110 pounds and not have donated blood in the past eight weeks (56 days). There is a one week wait to donate after any tattoos or body piercings. There are other factors that may affect your eligibility to give blood; any questions can be answered by calling 1-866-BLOODSAVES or by visiting www.inova.org/donateblood. Aspects of each potential donor’s health history are discussed as part of the donation process before any blood is collected. Each donor receives a brief examination during which temperature, pulse, blood pressure and hemoglobin (iron level) are measureOne blood donation can save up to three lives and there is an immediate need for all blood types. More than 250 blood and platelet donations are needed every day, year-round, for patients in area hospitals. Blood and platelets help many people, including trauma patients, surgery patients, newborn babies, cancer patients and transplant patients. Inova Blood Donor Services is the major supplier of blood products in the Washington, DC, metropolitan area. ARLINGTON, Va. – Washington Capitals forward Mike Ribeiro and his family, mascot Slapshot, John Marshall and more than 150 Capitals fans volunteered their time on Saturday, Aug. 25, at Thurgood Marshall Elementary School in Washington, D.C., as part of D.C. Public Schools’ (DCPS) Beautification Day. 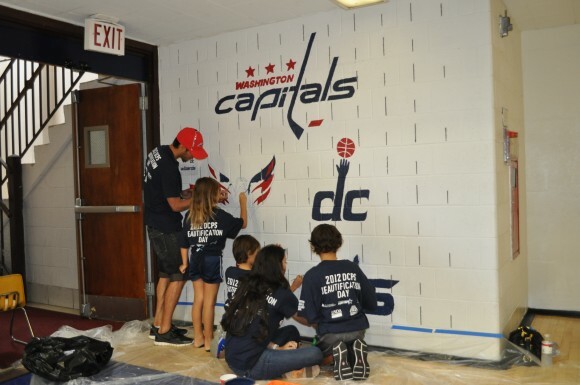 The date marked the second consecutive year the Capitals have hosted a project at Thurgood Marshall Elementary School and the fourth year the Capitals partnered with Serve DC – The Mayor’s Office on Volunteerism to participate in DCPS Beautification Day. Beautification Day was established in 2005 as an annual citywide “spruce up” of D.C. Public Schools prior to the first day of school. Thurgood Marshall participants were among approximately 4,000 volunteers participating at 115 D.C. Public Schools on Saturday. Ribeiro and volunteers worked on several exterior and interior projects around the school. Participants created vegetable garden beds with the U.S. Department of Agriculture’s People’s Garden initiative, weeded the grounds and cared for a garden created by volunteers last year. They also built three robotics tables, painted five murals, two bathrooms, a classroom wall and an elevator and assisted teachers with classroom set up for the first day of classes on Aug. 27. In addition to Ribeiro, Marshall, son of former U.S. Supreme Court justice Thurgood Marshall, participated with volunteers on Saturday. Marshall grew up as a Capitals fan and played hockey in Washington, D.C., at Fort Dupont Ice Arena. While attending Georgetown University, Marshall played hockey on the club-level team and continues to play recreationally today. Ribeiro, 32, was acquired in June from the Dallas Stars in exchange for center Cody Eakin and a second-round draft pick (54th overall) in the 2012 NHL Draft. He ranked tied for second in Dallas with 63 points (18 goals, 45 assists) in 74 games during the 2011-12 season. ARLINGTON, Va. – The Washington Capitals and mascot Slapshot, So Kids Can co-founder Elliot Segal from the Elliot in the Morning show, the Alexandria Redevelopment and Housing Authority (ARHA) and organizers from KaBOOM! 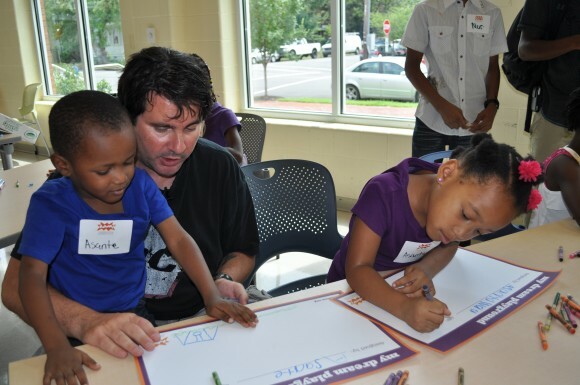 hosted a playground design day for children at the Charles Houston Recreation Center in Alexandria, Va., on Wednesday, Aug. 15. 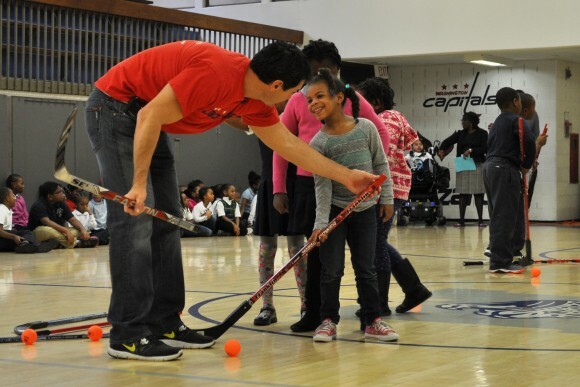 The Capitals and So Kids Can are partnering with KaBOOM! and ARHA to build a playground at the Hopkins-Tancil Court development in Old Town in September. The new S.T.A.R.S. Playground will provide hundreds of children in the Alexandria community with a safe place to play. 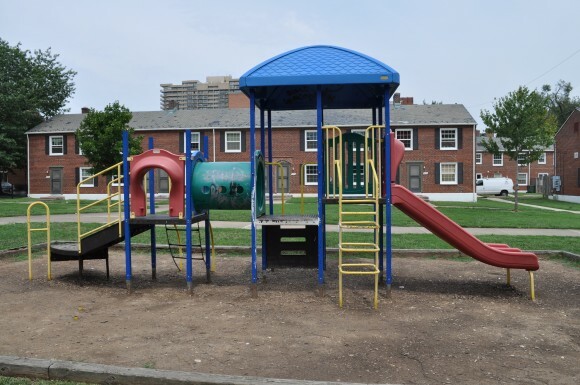 Currently the existing playground equipment is outdated, not wheel chair accessible and in need of replacement. During the design session Segal, Slapshot and 40 children from the neighborhood sketched their dream playgrounds. Elements from their drawings will be incorporated into the final design of the new playground to be built by So Kids Can participants Nicklas Backstrom, Mike Green, Brooks Laich and Segal along with 200 volunteers on Thursday, Sept. 13. The playground planning committee, which has been meeting since early January, will now have the next four weeks to finalize plans and prepare for the construction of the new playground and related side projects to create a unique family space. Funds for the playground were raised through So Kids Can during the 2011-12 season. Capitals defenseman Green and Segal created the So Kids Can program in 2008 to benefit youth focused, nonprofit organizations. 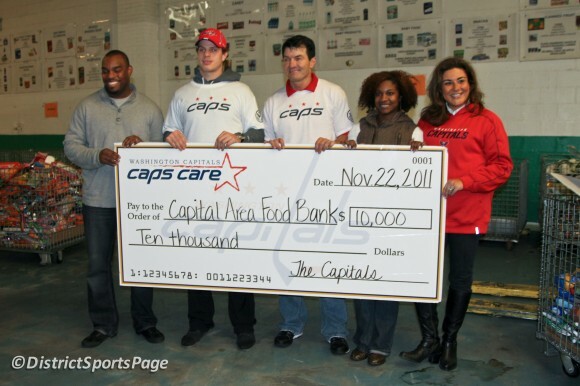 Last season Capitals forwards Backstrom and Laich also joined the cause. The playground will be the second built by KaBOOM!, the Washington Capitals and So Kids Can. More than $75,000 was donated to KaBOOM! 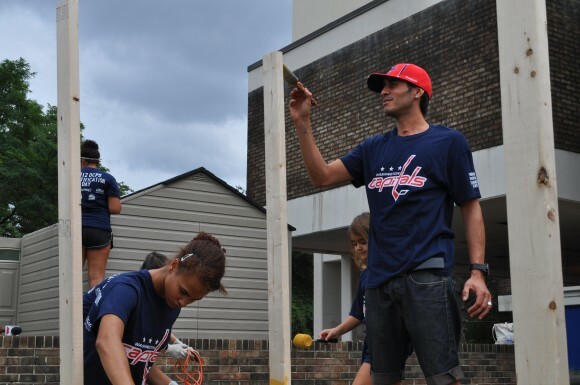 during the 2010-11 season to help build a Caps-themed playground at Associates for Renewal In Education in the Bloomingdale neighborhood of Washington, D.C. That site now serves more than 600 community members. The Alexandria Redevelopment and Housing Authority (ARHA) is a public agency that has established itself in Virginia as a leader in the provision, preservation and expansion of high quality affordable housing and the empowerment of low and moderate income families in the city of Alexandria. ARHA owns and manages 883 units of publicly assisted housing. Of this total number 713 are family assisted units with another 170 units for elderly and disabled individuals. ARHA also provides educational and career advancement opportunities to residents through social service programs in an effort to help residents on a path of self-sufficiency. Of the over 7,000 residents served, roughly 1/7th are children ages 4 to 17. Operating under the slogan of “Building Community Partnerships” ARHA takes great pride in working with a diverse group of partners to deliver value added programs and services to residents. For more information, visit www.ARHA.us. KaBOOM! is the national non-profit dedicated to saving play. Children today spend less time playing outdoors than any previous generation, a fact that is having disastrous consequences on their health, achievement levels, and overall well-being. To fight this play deficit, social entrepreneur Darell Hammond founded non-profit KaBOOM! in 1996 in Washington, D.C. with a vision of creating a great place to play within walking distance of every child in America. Since then, KaBOOM! has mapped over 89,000 places to play, built more than 2,100 playgrounds, and successfully advocated for play policies in hundreds of cities across the country. KaBOOM! also provides communities with online tools to self-organize and take action to support play on both a local and national level. Hammond chronicles the founding of the organization and the importance of the cause of play in his The New York Times Best Seller KaBOOM! : How One Man Built a Movement to Save Play. The book details how businesses and communities can work together to save play for children across the country. All author proceeds support KaBOOM!. Headquartered in Washington, D.C., KaBOOM! also has offices in Chicago and San Mateo, Calif. For more information, visit www.kaboom.org. (WOODBRIDGE, VA) – The Potomac Nationals are proud announce Washington Capitals Day is Sunday, August 12th at Pfitzner Stadium as the P-Nats host the Winston-Salem Dash at 1:05 p.m.. The day features Hall of Famer Rod Langway signing autographs, the Capitals cheer team the Red Rockets and mascot Slapshot. Capitals Legend Rod Langway will hold a meet and greet autograph session at the park on Capitals Day. Langway, known as the “Secretary of Defense”, was a two-time winner of the Norris Trophy which is given to the NHL’s top defensemen. He also finished second to Wayne Gretzky in 1982 for the Hart Trophy which is given to the MVP of the NHL. He won a Stanley Cup with Montreal in 1979. Langway was elected to the Hockey Hall of Fame in 2002. The day will also feature the best cheer team in the NHL: the Red Rockets who will have a meet and greet with the fans. The Red Rockets are also set for a pre-game presentation on the field. 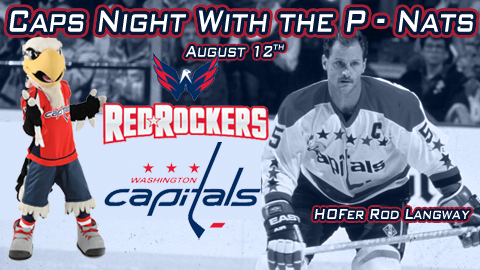 The Capitals mascot Slapshot will also be in attendance. He is set to assist during promotions during the afternoon game. August 12th will also be a Sunday Family Funday with player autographs before the game, kids running the bases after the game as well as post game family catch in the outfield. The Potomac Nationals are celebrating their 35th Anniversary of professional baseball and family fun, for all your ticket needs please call the box office at 703-590-2311 or visit www.potomacnationals.com. The Potomac Nationals, High-A affiliate of the Washington Nationals in Woodbridge, VA, announced Sunday, August 12 as “Washington Capitals Day” at Pfiztner Stadium as the P-Nats host the Winston-Salem Dash. The day features Caps Hall of Famer Rod Langway signing aoutographs, the Caps cheer team the Red Rockers and a special appearance by Slapshot, the Caps ever-popular mascot.